Based on their experience in planning and implementing programs for the Jewish Agency, Ms. Pushkova and Ms. Lysak would like to plan and direct ”fun and smart Jewish weekends" that help participants build Jewish identity through interesting activities. Developing such a program for an entire weekend would be challenging, they said, but they would like to try it. Some investment capital would be needed, they noted. Ms. Pushkova would like to expand her own design and illustration business, using Russian, English, or Hebrew in her work. Some of her holiday cards are already sold through friends and through modest efforts on the Internet. Another potential activity would be creation of films depicting various aspects of Jewish culture. 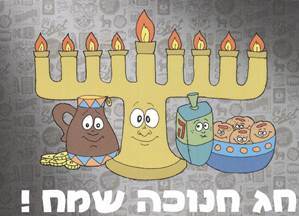 At left is a Chanukah card designed by Masha Pushkova. The actual card is the size of a conventional postcard. 85. 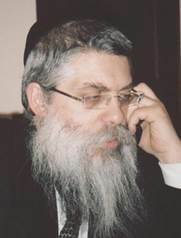 Rabbi Yaakov Dov Bleich, a native of Brooklyn and a Karlin-Stolin hasid, is the Chief Rabbi of Kyiv and Ukraine. He arrived in the country in 1989 and presides over the Great Choral Synagogue in the Podil district of Kyiv, an area of significant Jewish population prior to World War II. 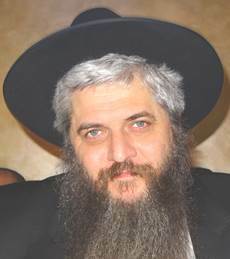 In the more than 20 years that he has served in Kyiv, Rabbi Bleich has developed a number of Jewish community institutions, including the Orach Chaim day school, homes for Jewish children from unstable families, a Jewish summer camp, an assisted living residential center for elderly Jews, a matza factory, the Jewish Confederation of Ukraine, the Union of Jewish Religious Organizations of Ukraine, and the Kyiv Jewish Religious Community. However, as described elsewhere in this report, a number of these programs are now jeopardized due to economic stress, Jewish demographic decline, and a lack of receptivity among local Jews to hasidic Judaism. Rabbi Bleich's native American English and familiarity with American culture have facilitated easy access to American representations in the Ukrainian capital. He also represents Ukrainian Jewry in several international Jewish organizations. He remains respected aming Ukrainian officials. Yet he is increasingly an outsider, absent from the country for weeks at a time while attending to family matters, fundraising, and participating in international Jewish events. Further, he is a Karlin-Stolin hasid in a country in which Jewish religious life is dominated by Chabad. In general, Rabbi Bleich said, times are very tough. The overall international recession is magnified in Ukraine, stated Rabbi Bleich, because the Ukrainian economy is dependent upon the export of steel and steel products, which are difficult to sell when the rate of new construction is in worldwide decline. The world price of steel, he continued, is now lower than production costs. Many wealthy Ukrainians have lost a great deal of money and are now attempting to sell their private aircraft, mansions, and other accoutrements of affluence. On a recent trip abroad, Rabbi Bleich confided, one of his fellow passengers in the economy section of the aircraft was a former oligarch who had been forced to sell his private airplane. The man recognized Rabbi Bleich and, embarrassed, asked Rabbi Bleich not to tell anyone else that he was flying coach class. Rabbi Bleich said that he has lost all of his local major donors. He is reducing the number of his foreign employees wherever possible so that he can avoid paying housing, international transportation and insurance, and other expenses associated with foreign workers. As noted elsewhere in this report, he is closing the residential programs for at-risk children that he has operated for many years. He has consolidated his school operations, using fewer buildings than previously. He also has reduced the length of summer camp sessions for girls and boys at the site that he owns and is now sharing camp expenses with Rabbi Shlomo Baksht of Odesa, who will send youngsters from Odesa to the same camp. Rabbi Bleich also has severely decreased allocations to several of the Jewish umbrella organizations that he sponsors, forcing them to curtail their programs. 86. A native of St. Petersburg (then Leningrad), Chabad Rabbi Moshe Reuven Asman studied Judaism in an underground quasi-yeshiva as an adolescent and subsequently moved to Israel where he entered a Chabad yeshiva. Rabbi Asman also studied in a Toronto yeshiva, but some Chabad adherents claim that he never completed rabbinic studies according to Chabad standards and never received Chabad smicha (ordination). Nonetheless, he settled in Kyiv and became rabbi of the famed Brodsky Synagogue (the Main Choral Synagogue) even as it remained under the control of a puppet theater. Rabbi Asman presided over removal of a puppet theater and subsequent renova-tion of the synagogue. The synagogue building now contains an elegant prayer hall, a kosher café, the upscale King David restaurant, a dining hall and café on the lower level, and offices for an independent welfare service. The syna-gogue also supports a burial service and its own cemetery. Rabbi Asman portrayed the financial well-being of his operations in a manner that differed sharply from that of his counterparts in every city and Jewish organization visited by the writer. He has, he said, no financial problems because "G-d takes care of everything." He has been able to attract many new financial sponsors, he continued, and has expanded his assistance programs accordingly. He is supporting the writing of a Sefer Torah for an Israeli organization and is providing financial assistance to Chabad emissaries in several smaller Ukrainian cities and towns who have difficulty finding sponsors on their own. 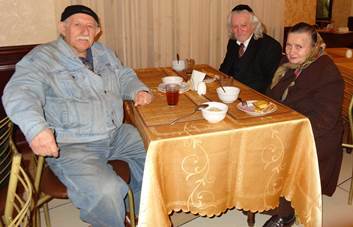 He has aided the Jewish community of Bila Tserkva (south of Kyiv, better known as Belaya Tserkov) for some years; this year, he said, he was able to find a British sponsor who recruited and paid for a native English-speaker to teach in the Chabad day school there (and a second teacher for Rabbi Asman's own day school in Kyiv). His synagogue dining hall, he stated, feeds about 200 impoverished elderly Jews every day, aided by a subsidy from JDC. About 150 people are offered Shabbat meals every week, and others enjoy weekday tea and cakes at a free café in space adjacent to the dining hall. On the holiday of Lag b'Omer, he continued, he chartered two river boats, each accommodating 200 people for free cruises on the Dnipr River; one boat was for Jewish elderly, and the other was for Jewish children. Additionally, Rabbi Asman said, the Brodsky synagogue welfare service offers free medical care to elderly and disabled Jews. Impoverished local Jews enjoy afternoon tea and cake at a free café in the Brodksy synagogue basement. A curtain separates them from paying customers, who are served the same food. The Joint Distribution Committee subsidizes a hot lunch program in an adjacent hall, but the synagogue bears the cost of the free café. The day school that he sponsors, known as the Mitzvah school, is thriving, averred Rabbi Asman As is the case in the school in Bila Tserkva, a native English speaker supported by a British sponsor, instructs pupils in the English language. However, he said, the school building requires major repairs. He continues to sponsor residential homes for at-risk children, Rabbi Asman stated. These programs currently accommodate about 25 youngsters, he said. In response to a question about a summer camp, Rabbi Asman said that he sold his summer camp, which was small and inadequate, several years ago when a sponsor promised to purchase another, more spacious property for him. However, Rabbi Asman recounted, the would-be benefactor reneged on his pledge and left Rabbi Asman without a camp. 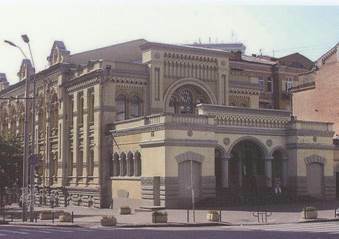 NThe Great Choral Synagogue on Schekavitskaya street in the Podil district of Kyiv should not be confused with the Main Choral Synagogue in the same city. The latter, better known as the Brodsky synagogue, is larger and more centrally located. Built with funds contributed by Lazar Brodsky of the wealthy sugar industry family at about the same time as the Schekavitskaya street synagogue, the Brodsky synagogue was confiscated by Soviet authorities in 1926 and converted into a workers’ club. It later became a variety theater and a children’s puppet theater. After substantial international pressure, the Brodsky synagogue was returned to the Jewish community in the 1990’s and restored. Rabbi Moshe Reuven Asman, an independent Chabad rabbi, presides over the Brodsky synagogue. Not all observers in Kyiv concur with this assessment.